The giraffe is the tallest living terrestrial animal. The giraffe's chief distinguishing characteristics are its extremely long neck and legs, its horn-like ossicones, and its distinctive coat patterns. Each of the four species is distinguished by its coat patterns and genetics. Giraffes usually inhabit savannahs and woodlands. Their food source is leaves, fruits and flowers of woody plants. 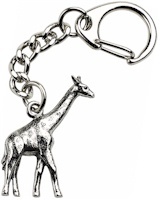 This giraffe is made from pewter an is supplied on a quality key-chain.